Rome is the capital of Italy with two thousand years of history, one of the largest cities in Europe with a rich legacy of the ancient world and the Roman Empire. Traveling and celebrating weddings in Italy do not make sense without a visit to this famous city. Rome is not only a legendary attraction and a symbol of majesty, power and authority, but also a nice city with beautiful streets, avenues, squares, parks and gardens, with an atmosphere of romance, love and beauty which will definitely satisfy your dream of getting married in Italy. Rome is situated in the region of Lazio, and at the same time it is the center of the province with the same name - Rome. The city is located in the central region of the Apennine peninsula, or exactly in its western part, on the side of the Tyrrhenian Sea, where the famous Tiber River flows, at a distance of 30 km from the capital. Old Rome stands on 7 hills of an altitude from 13 to 139 meters above sea level. Here are their names: Capitol, Palatine, Aventine, Caelian, Viminal Hill, Esquiline and the highest hill Quirinal. Spring and the first month of autumn are the best times to travel to Rome. Planning weddings in Rome in these seasons, you are giving yourself the opportunity to enjoy, free of crowds of tourists, the city with a comfortable weather. The average temperature of warm months is + 23 + 25 degrees. In March and mid-April you may enjoy not only the sunshine, but also refreshing and short rains. In winter, the weather is quite warm, and cold weather is very rare. The average weather reaches a temperature of 10 degrees. In January, in Rome the season of post-Christmas holiday sales opens. So you cannot just have your wedding, a romantic getaway or honeymoon in Rome, but also buy something you like at very low prices. It’s easy and safe to fly on an airplane to Rome, from any part of the world. Moreover, the representative of the Italian Wedding agency with a great pleasure will meet you at the airport and transfer to the place of residence in Rome. 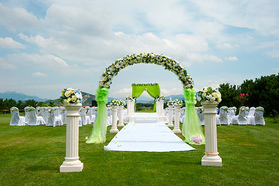 For more information about how to get to Rome, please contact the Italian Wedding agency. Temple of the Pantheon is a legendary building with a two thousand year history. Coliseum - an archaic structure of antiquity is a symbol of greatness and power. Basilica of Saint Mary Major is one of the most famous churches, which represents a monument of a tremendous beauty and grandeur architecture, at which worked the most talented artists of the Roman Empire to create this magnificent place. Villa Borghese is a large stunning park containing a number of Borghese museums and galleries. The park is a favorite place for local people as well as for visitors. Borghese Park is a good place a memorable wedding photo session, in a natural environment of beauty and harmony. Trevi Fountain, overlooking the Neptune sculpture is one of the most beautiful symbols of Rome. Vatican - State of the State is the center of the Roman Catholic Church. St. Peter's Basilica is the expression of the beauty triumph of the material world. The world’s famous masters, like Bramante, Michelangelo and Carlo Maderno have worked on the creation of this masterpiece of interior work. The Sistine Chapel - at which Raphael and Botticelli worked, is especially famous due to the brilliant artwork of Michelangelo - fresco of "God's judgment." The Sistine Chapel is one of the most popular places where wedding photo sessions often take place. Nowadays, Rome became one of the best cities in Europe for celebrating a wedding. 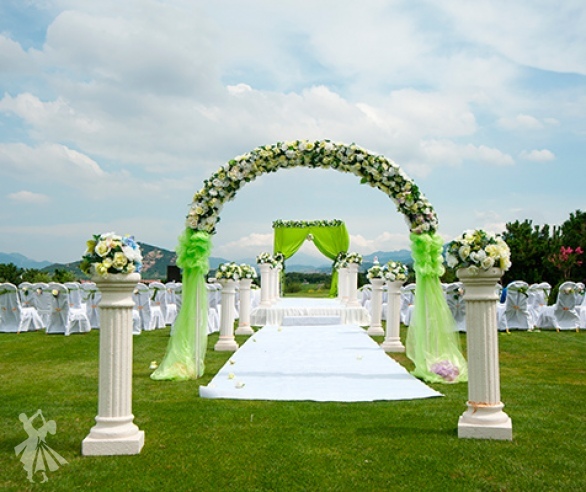 And that’s not particularly for its unique architectural treasures of world renown, but also due to perfect organization of wedding ceremonies and celebrations, high quality services and of course, the impeccable taste of Italian cuisine. Rome is absolutely a historical museum with a world heritage of culture and old art from the ancient and medieval times. Therefore, almost every building here is a historical monument. Also, it's worth saying that you were not visited Rome if you did not visit the most significant places - not only the city symbols, but also of the whole Italy.